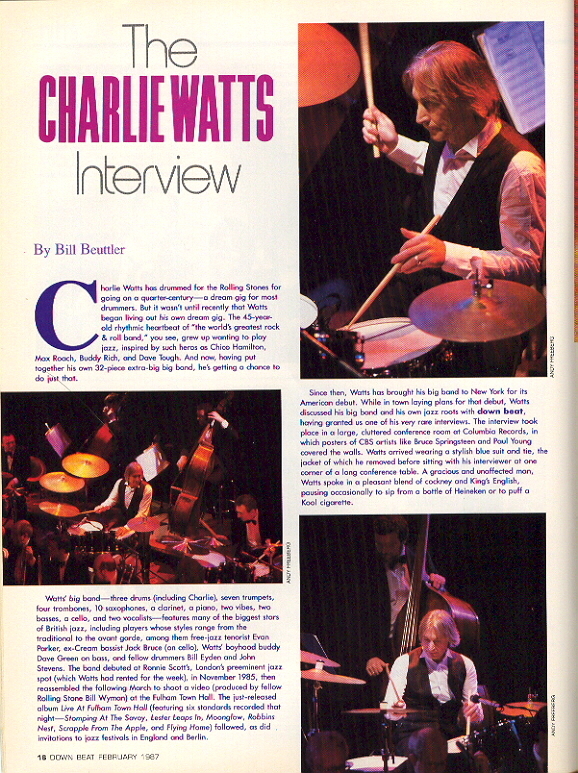 Charlie Watts has drummed for the Rolling Stones for going on a quarter century-a dream gig for most drummers. But it wasn't until recently that Watts began living out his own dream gig. The 45-year-old rhythmic heartbeat of "the world's greatest rock & roll band", you see, grew up wanting to play jazz, inspired by such as Chico Hamilton, Max Roach, Buddy Rich, and Dave Tough. And now, having put together his own 32-piece extra-big band, he's getting a chance to do just that. Watts big band-three drums (including Charlie),seven trumpets, four trombones, 10 saxophones, a clarinet, a piano, two vibes, two basses, a cello, and two vocalists - features many of the biggest stars of British jazz, including players whose style range from the traditional to the avant-garde, among them free-jazz tenorist Evan Parker, ex-Cream bassist Jack Bruce (on cello), Watts' boyhood buddy Dave Green on bass, and fellow drummers Bill Eyden and John Stevens. The band debuted at Ronnie Scott's, London's preeminent jazz spot (which Watts had rented for the week), in November 1985, then reassembled the following March to shoot a video (produced by fellow -Rolling Stone Bill Wyman) at the Fulham Town Hall. The just-released album Live At Fulham Town Hall (featuring six standards recorded that night-Stomping At The Savoy, Lester Leaps In, Moonglow, Robbins Nest, Scrapple From The Apple, and Flying Home) followed, as did invitations to jazz festivals in England and Berlin. Since then, Watts has brought his big band to New York for its American debut. While in town laying plans for that debut, Watts discussed his big band and his own jazz roots with down beat, having granted us one of his very rare interviews. The interview took place in a large, cluttered conference room at Columbia Records, in which posters of CBS artists like Bruce Springsteen and Paul Young covered the walls. Watts arrived wearing a stylish blue suit and tie, the jacket of which he removed before sitting with his interviewer at one corner of a long conference table. A gracious and unaffected man, Watts spoke in a pleasant blend of cockney and King's English, pausing occasionally to sip from a bottle of Heineken or to puff a Kool cigarette. BB: What is your history as a drummer? I've read that you started out drumming on a banjo with its neck twisted off. CW: Yeah, I bought a banjo, and I saw all these dots in a book-did you ever see a banjo book or a guitar book ? I couldn't have done that. Oh dear, all these little dot things. So I took the neck off, and about the same time I heard a drummer called Chico Hamilton. It was a record called Walking Shoes by Gerry Mulligan and I fell in love with the sound of the brushes. So I bought a pair of wire brushes and used the banjo, the skin of it - now it's probably worth more than a snare drum - as a drum. Luckily it wasn't double-backed-you know some banjos have got backs on, wooden backs or metal backs; this was just an open one. So I made a sort of wire stand-I was 12 or 13, I think. BB: How long before you actually had a set? CW: My dad bought me one off a friend of his. I suppose a few years, a couple of years-and then the noise started in proper. I mean. they're the worst thing you can get a kid. They're an awful lot of fun, but they're the worst instrument to actually learn to play, noisewise. They've got all these practice pad-type things, but there's no point in playing them, because half the fun when you first start is the sound of the drums. And the noise is unbelievable, it just shakes an apartment. That's part of the horror of playing them-controlling the volume. BB: How were you trained as a drummer? Did you play along with records? Did you have lessons? CW: No, I never had lessons. Used to try to play to records, which I hated doing. Still can't play to them. I know guys who can, kids as well-they put on a record, sit down and play with it, every lick. I could never do that. Even at the age of 14 or so it seemed synthetic-it wasn't the same as playing the thing. And I hate playing with cans [earphones] on, too-I always play with one on and one off. BB: Do you read music at all? BB: How do you manage to get through your big band's charts? CW: Well, you don't have to read if you've got someone to hit the shots for you. That's Bill Eyden. He's someone I used to see at the bar a lot when I was very young. He's played with everybody. He's a great reader, the ultimate pro. You need a good reader in that band, because it takes John [Stevens] a long while to read the charts and it takes me a lifetime. This way I can do them-the only thing is remembering them all. Readers don't have to remember all this stuff. It must be great for them. You know, when you go on stage and your adrenaline gets going you always-well I always do-forget arrangements. Those guys don't even have to think about it. They can have a few beers and they're covered, because they can read it. That doesn't mean to say they're going to play it exceptionally well, but they will know where they are. You need to read with that many people, the discipline of it all. BB: You've got what, 30-some people? CW: I just wanted a band with them in it. BB: How did you pick the players? CW: All my favorite players. I mean if I'd have been living in America I'd have had a whole different set of players. These are people I've admired for years. I've always wanted to play with them. BB: Do you spend a lot of lime in the clubs in London? CW: Not really. I go to them occasionally. I saw Chet Baker recently. If I'm in London for a week I'll go to Ronnie Scott's once. He gets the best players--Buddy Rich was just there. I usually go to clubs here, to see Tony Williams play for example. BB: Have you seen his new quintet? CW: No, I haven't seen Tony for I don't know how long. He said hello to me once at the Village Vanguard, I think. It was when he played with Ron Carter and Hank Jones, just a trio. The next day he introduced me to an English guitarist, Allan Holdsworth-he had a band with Allan then. I saw Tony when he was 19, in England with Miles, and he was incredible. I immediately asked Gretsch to send me a kit like his. That's the kit he had at the Vanguard; the next night he had these two bass drums, and he was into something else. A marvellous player, one of the best actually. Still so young-it must be very difficult for Tony Williams to know what to do next. With Miles Davis at 17, taking the drumming world as well as the musical world by storm at 19-and there you are, you've got to make your living from that level up. You know what I mean? It's very difficult. His Lifetime band was great. I saw them. BB: I've read about the Stones going to check that out. CW: Mick Taylor took us; this was when John McLaughlin and Larry Young were with Tony. He was fantastic then. And then I saw some things that he did with Jack Bruce. Hopefully, Jack's coming over with the big band. I haven't even spoken to Jack--he's one of those guys who you ring up and if he can make it, he'll make it. Lovely bloke, Jack. BB: Who are some other drummers that you listen to? CW: I listen to them all. I don't know why, but David Tough is someone whom I've always loved--the recordings of him with the Herman First Herd, Northwest Passage and Countdown. He did some great stuff with Benny Goodman I try to listen to a lot. There's so many--especially young players. There always has been. BB: Do you listen to rock as well? CW: Rock & Roll? Sure. BB: Do you how any favorite rock 'n' roll drummers? CW: Not really, because I don't really know a lot of the guys'names. CW: I don't really know. I know Max [Weinberg]. He did the best book on drummers written. I love it because he didn't give it to somebody else to write; he actually wrote it, which really knocked me out. He wrote some very nice things about me as well. He actually had me, all his influences--the one on Ringo's very good. They're actually little articles written by someone who knows drummers. BB: How about yourself? I've heard you've written a book about Charlie Parker. CW: It's a kids' book. I did it when I was 20. BB: Is it available anymore? CW: Anymore? It was only available for a year, and no one would stock it at the time. It came out when the [John] Lennon book, In His Own Write, did--the same publisher that did Lennon's book did my book. But the stores wouldn't take mine because of what it was. A lot of people ask me about it. It's got all of Parker's life in it, all wrapped around this fictitious bird. It's written for kids, you'd get through it in a minute; it's not like Max's book. BB: When you were growing up, who were the main people that made you want to play jazz? CW: Well, on records it would be -- there's so many aren't there? I suppose Charlie Parker, which would be Max Roach, wouldn't it? Buddy Rich, but Buddy Rich's greatest achievement is the actual amount of people he's played with. Some of his best recordings Ella & Louis, the control that he has on that record is beautiful. He did two, I think, with bands led by Count Basie. There's one of them where he does an intro just on the hi-hat -- amazing, it's all there in just eight bars. BB: And it was your intention to become a Jazz player yourself? CW: I always imagined so. In England, really, the biggest hero was a man called Phil Seaman. There's a tradition of players that look and play like him --John Stevens is one. And the sad thing is that Seaman never got to America. But an amazing player, totally unique. First guy I ever saw play timp-style -- he invented it. You know, instead of playing like that [demonstrates], which is chop-style, he played with his fingers, like you actually play a timpani drum. When you roll with timps you fan, and he'd be playing like that. Ginger Baker's another one that I wanted to play like. One of the first good bands I got in was Alexis Korner's band -- Jack [Bruce] was in that band, he played upright bass and cello. Ginger used to play in a jazz octet, the best band in London at the time. Ginger had a kit that he actually made, the first plastic kit I'd ever seen. Those were the days when you had calf heads, but his were like real African drums-which are actually animal skins, shaved off -- so they were about a quarter-of-an-inch thick. He's the only guy I've ever seen get any sound out of his tom-toms. I borrowed them off him one night he was on the first act, the Stones were the next band on, and then Ginger with Alexis -- and couldn't get anywhere. Broke about four sticks. I don't break drum sticks normally, but Ginger's chops are so strong. They still are. I tried to get him to play in this band actually, but I couldn't get a hold of him. BB: How old were you when you joined Alexis Korner's band? CW: I was 21, I think. I was working in Denmark, came back, and he asked me to join his band. That was the first time I ever played with a harmonica player, and that was Cyril Davies. He was a Chicago-style blues player, and that was what he wanted the band to be like -- I'd have to play like Francis Clay or Freddie Below. BB: How did you adjust to playing the blues? CW: I listened to the records, and Alexis taught me. And Keith [Richards] and Brian [Jones] taught me, through constantly playing Jimmy Reed. Reed and his drummer, Earl Phillips, were as sensitive as Paul Motian with Bill Evans. Motlan, with Scott La Faro and Charlie Haden, was one of the most sensitive drummers -- the rhythms would just go around and inside each other. In a different way from how the rhythms would turn inside each other for another great drummer, Dannie Richmond, under the direction of Charlie Mingus, who I saw an awful lot of. I don't mean in the same way as another brilliant player -- who I suppose as a kid I always wanted to look like and play like -- Joe Morello. Morello would play time sequences, whereas Dannie's time would be more out in the air. It'd turn around, because Mingus would make it do that. He'd build up the time and it wouldn't matter, because it would just lead into this amazing burst, or it'd stop -- but it'd be stop shuffle and ad those things. A lot of those Mingus albums on Atlantic are quite incredible. BB: Like the Changes albums and Carnegie Hall? CW: That is one of the great records. That's what I'd like my band to roar like. I mean, it would never sound as precisioned as Basie's band, but that takes 40 years of being on the road. But I'd like it to surge like Mingus'. Use it as a vehicle, and use every great player in it. It's that knowledge like Miles Davis has, that knowing when to stop the thing and when to start, who to point to. Duke Ellington had that, his bands were just Its arms, like Mingus' band was just his arm. If he wanted it to sound like a boogie band, he'd just play those ticks. Or he'd sit at the piano -- on one of the great Mingus albums he played piano. It's an incredible record, a better fusion of boogie music and what you might call contemporary jazz than a lot of actual boogie piano players -- that's what it's like having Pete Johnson do it with Albert Ammons. That's what Ian Stewart was his best at. Anyway, when Mingus did shift a gear he knew who to have there. Miles Davis is the same. Miles Davis has never had a bad band in his life. The last one I saw was with Al Foster, and it was incredible. Art Blakey's another one who can pick players, can't he? Look at the people who have gone through his band. BB: And he is in his mid-60s now, still playing great. CW: The guy is something else. Buddy Rich is one of those people. I don't like drum solos, to be honest with you, but if anybody ever told me he didn't like Buddy Rich I'd right away say go and see him, at least the once -- just to see him sit at the set of drums and play. That is remarkable just to see it. Blakey's the same way. One of the loveliest record that Blakey's made, I think, is with Cannonball Adderley and Miles Davis-I think Autumn Leaves is on it. Make you cry, that one. BB: Let's get back to your big band. Is this a short-term project for you? CW: I don't know. It was originally, and people have asked us to do this. I'll fit it in with my life and if we do anything with the Stones. My band - they're all bandleaders, so it's hard to get them all together. They're booked so far in advance; it's not like me- I do a stint with the Stones, and then I won't do any more. With those guys, the phone's always ringing. BB: Do you sit in very much at jazz clubs? CW: Hardly. No, it'd scare the life out of me. I'm not very good at that. BB: How do you keep your jazz chops up? Do you practice? CW: No, not really. It's just in me I suppose. It's the same thing to me as playing rock & roll. You have different roles to fill, but it's the same sort of work. You've still got to be there all the time. BB: Does the big band rehearse much? CW: No. Berlin was the first time we'd played in three months. That's why it's good to play a set that you sort of know. It takes that sweat away. But we're going to rehearse to come over here. We' ll be doing five original things that two of the guys have written, and we're going to have to rehearse them. BB: Who's writing for you? CW: Bobby Wellins, the tenor player, has written three things, and a trumpet player, Jimmy Deuchar, has written two -- he's probably the best writer in the band. BB: What sort of rapport do you have with London and American jazz players? Do they resent the amount of money you've made with the Stones? CW: I have no idea. I suppose I would feel like that if I'd done something for 20 years, if it was my life's career, and I got $10 for turning up, and someone else.... I don't know if it actually would affect my opinion of either their ability or what they're like as guys. BB: Sonny Rollins played on one Stones album. Did you enjoy doing that? Was it recorded live? CW: No, that was overdubbed. That's one of the things that's happened with the saxophone, in rock & roll anyway. It's either just an eight-bar overdub, or it's just a section to play through onstage. I think Bruce [nods toward a Springsteen poster] has got a guy, hasn't he? CW: Yeah. He's probably more involved in the actual show than most rock horn players. BB: There was one tune on the album with Rollins, called "Slave," with a bass line just like a Miles thing, from around the Big Fun period. It goes [sings seven-note lick]. Was that deliberately lifted? CW: God, I'd love to hear that. Yeah, I know the track—it is the same, isn't it? It might have come through in a different way, but it wasn't a conscious lift. I might consciously try lifting something that Tony Williams would do, but that's because I listen to him; Bill [Wyman] doesn't listen to Miles Davis, or I doubt he'd ever listened to that album. BB: As far as the big band's concerned, most of the stuff you seem to be going toward is swing stuff. . .
CW: Well, it should all swing, Chuck Berry swings, doesn't he? CW: Yeah that was the idea. Half of the band [laughs], 10 out of 30, are free music players. Simon Phillips -- he's not on the album but he's coming over with us -- Evan, Paul Rutherford, Dave De Fries. There's a whole crowd of people that John Stevens plays with. I always think of Evan Parker as being a bright new star; Evan's about my age, actually. He, like John, has been playing free music for 20 years. You'd think free music was this new sort of thing. It's got a hell of a lot of nuances, that-bloody amazingly complex things. BB: Do you want these players to move the band away from swing and more toward free music? CW: I want this band to do both [laughs]. I want a mixture of players. Somebody asked me who I'd want if I had an American band. I'd choose as diversely - I'd ask Anthony Braxton, and I would love Paul Quinichette, although I think he might have died a couple of years ago. But you know, that sort of thing. They all actually play. It's just that a lot of people won't listen to one and then listen to the other. If you lock the doors they've got to listen to them all. 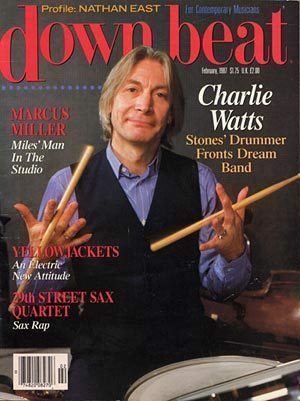 Charlie Watts uses Gretsch drums, primarily because of advertisements he saw in down beat while a fledgling drummer. "I've always used really old ones." he explains, 'and they're usually rented ones that I find - I say, "These are nice, I like these". I did that, with a guy in L.A., I was doing an album with Ronnie Wood, and a guy I met had this pet drum kit -- this is the old Gretsch and I fell in love with it. I said: "Can I have this ?" And I think he was a bit choked to lose this one that'd he'd done up [laughs], but he sold it to me. But I've always used Gretsch, because of the adverts they used to have in down beat. I've still got all those down beats. I've got the drum issue of '56 -- Max Roach is on the cover. But they used to do marvellous adverts. I mean, obviously I took no note of the Conn or Selmer ads, but there used to be great photo of Lee Morgan or somebody sitting there. When I was a kid we used to dress like Shelly Manne, because of the adverts. He used to have those Ivy League jackets on, and we used to go out and try to get those at import shops in England, with button-down shirts -- there was a whole style". Watts kits are standard four-pieces setups, largely for the same reason. "I still use the same one that Max Roach advertised you should buy, which was the soft tom-tom, bass drum, deep tom-tom, and a snare drum". He isn't fussy about his cymbals. "I pick them up from anywhere" he says. "They are mostly Avedis [manufactured by Zildjian] and they're quite old ones." Watts has yet to embrace electronic drums himself, but he recognizes certain advantages to them. "I'm not interested in it, inasmuch a I wouldn't particularly want to do it, but I am interested in what other do with it, it saves a lot of mic-ing up if you are doing that rock & roll sort of thing -- if you are in middle of the Astrodome or New Orleans' Superdome you have to send somebody up with a walkie-talkie, and he'll say, "Can you hit the bass drum a bit harder?" Well yeah, but only up to a point -- then you begin losing balance and touch. The pads take all that [hassle] out, because they pick it up direct. But Watts is quick to point out that electronics, for him, will never replace the real thing. "For me, it's not the same as seeing Steve Gadd of Buddy Rich sit down and play. The real ability of playing a drum kit is the ability of playing with different instruments at different volume -- a tenor solo is different from a bass solo. You have to have volume under control, but it's a volume that you have from your wrists or your fingers." That, says Watts, is challenge enough for him. "It's been years and years and years I've been playing the drums, and they're still a challenge. I still enjoy using drumsticks and a snare drum."